Eagle Peak is 2 miles northwest of Mt. Diablo’s main summit. This hike climbs up to Eagle Peak from the Regency Gate Trail head in Clayton. Take Back Creek Trail to Murchio Gap and continue on Eagle Peak Trail to Eagle Peak. 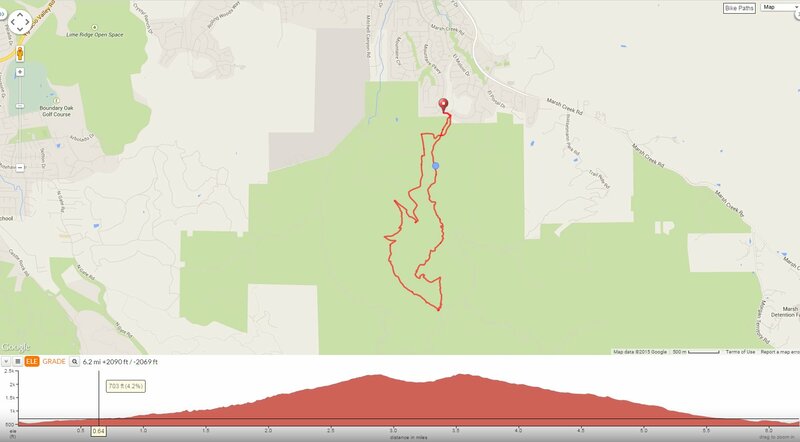 Descend the mountain on Eagle Peak Trail to Bruce Lee Rd and continue on Murchio Rd for the return on Back Creek Trail to Regency Gate trail head. Mile 0.0-trail junction: go straight on Donner Canyon Rd. Mile 0.1-trail junction: turn right onto Back Creek Trail. The trail cuts across the open grasslands along the lower foothills of Mt Diablo. Mile 0.3-at Back Creek Trail junction: turn right followed by an immediate left turn at Murchio Rd Trail junction to stay on Back Creek Trail. The trail winds along Back Creek through the dense foothill woodlands to a couple of creek crossings. Mile 0.8-at George Cardinet Back Creek Trail sign-go straight and continue along the creek. Mile 1.0-at Tickwood Trail junction: go straight to stay on Back Creek Trail. The trail narrows as it follows along side the creek. Mile 1.5-at Meridian Point Trail junction: go straight to stay on Back Creek Trail. The trail continues to steadily climb through the dense woodlands and opens out along the side of the mountain on a rocky gravelly road. Mile 2.7-at Meridian Ridge Rd/Eagle Peak Trail junction: turn right and continue on Eagle Peak Trail. The trail gains in elevation up to the high point of the rocky ridge. Enjoy the views along the ridge! Mile 3.2-Eagle Peak Trail exits the thick mountain brush covered slopes out to an open ridge with magnificent vistas! The trail leads to a rockier ascent to the level plateau summit at 2369 feet. Mile 3.5-arrive at Eagle Peak! Sit for awhile and enjoy the 360 views of the entire Bay Area and beyond-the expansive summit top views are phenomenal! It’s simply amazing-on this clear day,we saw the snow capped Sierra Mountains-WOW! Enjoy the gorgeous Eagle eye views from Eagle Peak! Head north on Eagle Peak Trail; the narrow ridge line trail continues over the summit followed by a drop through high dense vegetation along a stretch of beautiful moss covered embankment. Mile 3.6-turn left to stay on Eagle Peak Trail. The trail continues to wind its way in and out of the dense brush. It’s exciting to see new growth vines and other grasses along the slopes of the mountain! The trail exits the covered thicket to the next trail split. Mile 3.7-turn left to stay on Eagle Peak Trail. The trail cuts through the thick chaparral covered ridge line. Admire the expansive valley vistas and in your face mountain views! The narrow trail continues descending with some steep stretches-watch your footing! The trail seems to level out for a short bit through a section of beautiful red blooming flowers-Indian Paintbrushes. Mile 4.3-turn right to stay on Eagle Peak Trail to Coulter Pine Trail. The trail continues traversing down the mountain through the thickets with the occasional glimpse of Mt Diablo to the south. The steep terrain winds down through some Coulter pines along the exposed slope into the shaded brush. The packed dirt trail becomes slippery terrain with loose rocks. Eagle Peak Trail weaves down through the shaded woodlands before exiting out onto the open grasslands. Mile 5.5-at Coultier Pine/Bruce Lee Rd Trail junction: turn right and continue on Bruce Lee Rd. The trail leads down to the expansive oak studded grasslands around Diablo’s foothills. Mile 5.7-at Murchio Rd Trail junction: turn right and continue on Murchio Rd. The road takes you through the open valley meadows across back Creek followed by a short climb over the low hill to Back Creek Trail. Mile 5.9-at Back Creek Trail Junction: turn left to stay on Back Creek Trail to Donner Canyon Rd. The trail takes you up and over the rise through the oaks towards Regency Gate. Mile 6.1-Arrive at Regency Gate Trail head. Exit the gate and climb the short trail up to Mountaire Pkwy. This is a gorgeous hike that climbs through the steep and dense chaparral covered slopes along the north side of Diablo. The high ridges along Eagle Peak provide sweeping views of the entire area with fabulous views of Mt Diablo to the south. You’ll enjoy the astounding panoramas from Eagle Peak at 2369′, you’ll be glad you did it-the pay-off is priceless! Get a *trail map, gear up and enjoy everything Mt Diablo has to offer: rugged mountain scenery, meadows and open grasslands, oak studded foothills, creek side vegetation, wildflowers and endless panoramic vistas! Wildflowers seen along the trails: ithuriel’s spears, purple veitches, blue dicks, wind poppies, chinese house, monkey flowers, yarrow, gumweed, california poppies, indian paintbrushes, sunflowers, fremont star lilies and virgin’s bowers. Sunny and warm with clear blue skies. Temps ranged from the high 50’s to the mid 60’s with N winds.